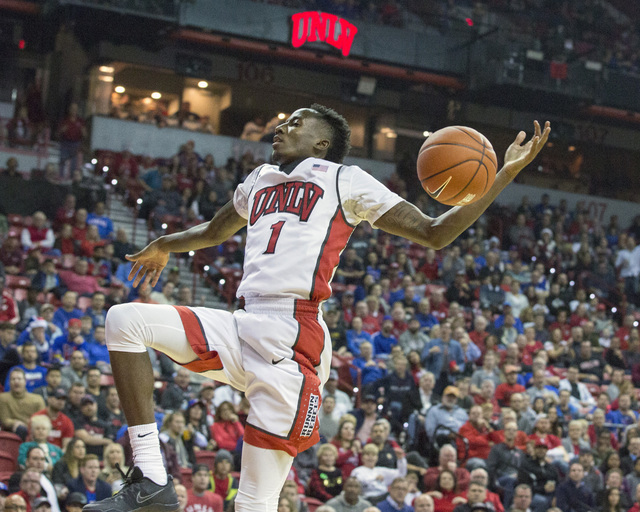 A few things are undeniable: UNLV is likely a few recruiting classes from being NCAA Tournament worthy, and yet its fan base expects a nonconference schedule littered with high major opponents. The one-person country act that broke out at halftime at the Thomas & Mack Center on Thursday night, which you would have thought might be aided by better acoustics given the music was played from a tape and UNLV just spent $73 million renovating the place, was unexpected. There wasn’t much of it those first 20 minutes. They announced a gathering of 14,116, and a fair estimate was likely a 60-40 split in terms of those wearing red to blue, but you got the feeling shortly after tipoff everyone anticipated the same outcome and responded accordingly. 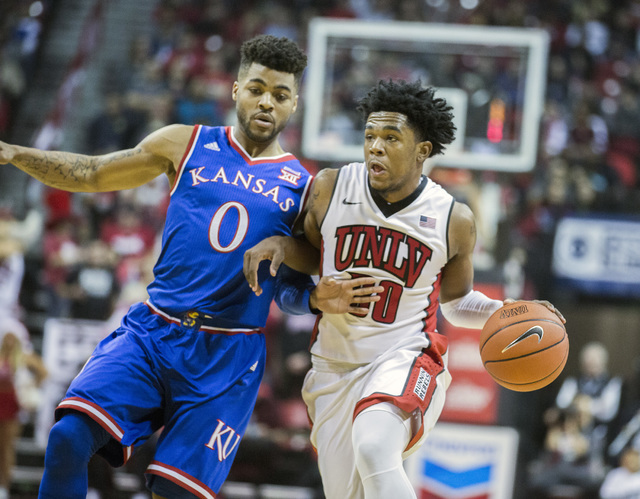 Kansas wasn’t near its best and yet still won by a comfortable 71-53 final, thus ending the nonconference portion of UNLV’s schedule under first-year coach Marvin Menzies before Mountain West play begins Wednesday at Colorado State. Kansas played the second half as if it were a thousand or so miles from home a few days before Christmas and well aware it was never going to lose, and yet UNLV did some good things over that time it can build off for league. There were a few runs during the game when folks actually reacted louder than when cheerleaders rolled out the T-shirt cannon during a timeout, but things were pretty well settled at intermission, when the Jayhawks led 42-20 and the Rebels had sleep-walked through 20 minutes of poor play at both ends. They’re just not ready to compete with elite. UNLV as it exists now was in no way prepared to deal with a 12-day stretch that included games against Duke, Oregon and Kansas, a schedule made by a previous coaching staff that believed it not only would be employed at the school for such a challenge but also feature a roster of talent capable of meeting it. “I have some good news and some bad news,” Menzies said. “I’ve always wanted to be in the Final Four, and this is as close as I have been, playing three Final Four (caliber) teams. That was fun … I’m proud of my guys. They gave a really, really great effort in the second half. Even the most prepared Mountain West team would have struggled discovering much success against such a three-game gauntlet, and it raises a question about how Menzies intends to schedule as he builds the program in the next few years. His answer: Same as UNLV always has. A few things are undeniable: The Rebels are likely a few recruiting classes away from being NCAA Tournament worthy, and yet its fan base expects (demands) a nonconference schedule littered with Top 25 and high major opponents. This isn’t a town that gets excited about too many Cal State Fullertons and UC Riversides, no matter how many wins the Rebels might collect. “Our (nonconference) scheduling will be similar in level of competition as it has been here,” Menzies said. “A lot will have to do with what kind of team we envision having each year, but we’re not going to just play a bunch of guarantee games. We’ll never be that team. That’s not going to happen on my watch. 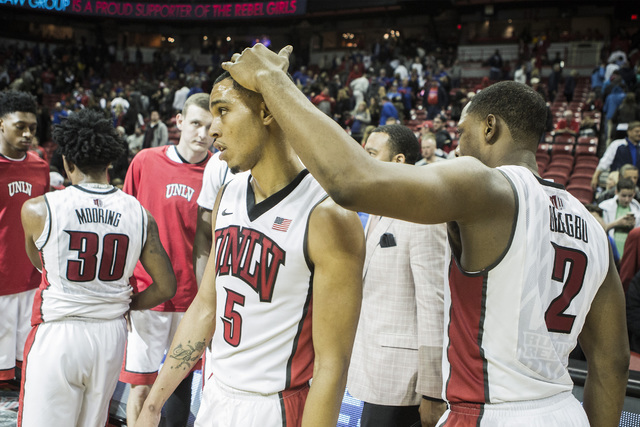 UNLV is scheduled to play Arizona next season, and Menzies expects to add other like opponents, along with an exempt event such as the Diamond Head Classic in Hawaii, which the Rebels are penciled to play in 2018. I’m not sure how much better the past 12 days made a UNLV team still battling injuries to key players — there were also home wins against Incarnate Word and Southern Illinois during the stretch — and yet there is nobody in conference that will resemble what were three losses to ranked teams by an average score of 83-54. More than worrying about comparing ability in the next 18 games, the Rebels need to instead prove capable of competing on the road in altitude in some of the more unique venues college basketball offers. Things begin fresh Wednesday in Fort Collins. That outcome, whatever it proves to be, won’t be as predictable as the latest one. Hey Reb, though, did dance at midcourt during the one-person country act. Who could have saw that coming? Contact columnist Ed Graney at egraney@reviewjournal.com or 702-383-4618. He can be a heard on “Seat and Ed” on Fox Sports 1340 from 2 p.m. to 4 p.m. Monday through Friday. Follow @edgraney on Twitter.